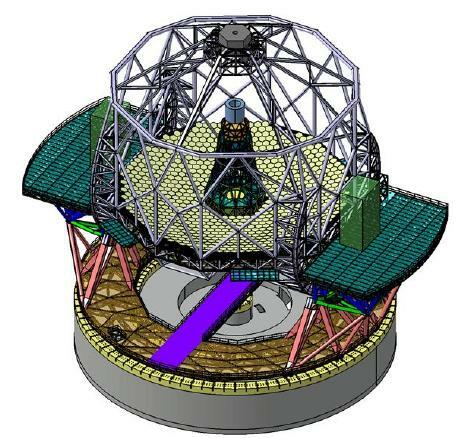 The telescope structure is an alt-az mount (see Figure 1) and it is divided into two main parts: the Azimuth Structure and the Altitude Structure. The main structure, including the hosted units and the items intended for operational use, weighs about 2800 t. Two massive cradles provide the rotation of the altitude axis while the azimuth tracks allow the rotation of the telescope about the zenith. 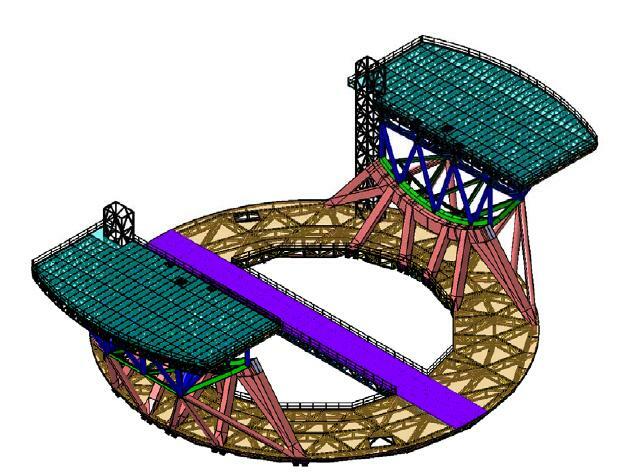 The challenge in such a massive design is to provide a stiff enough interface for the primary mirror segments, while at the same time not dramatically increasing the weight of the structure or overcomplicating the support. Scaling the size of M1 to the current dimensions has made it possible to achieve a lighter, stiffer and more compact telescope structure. 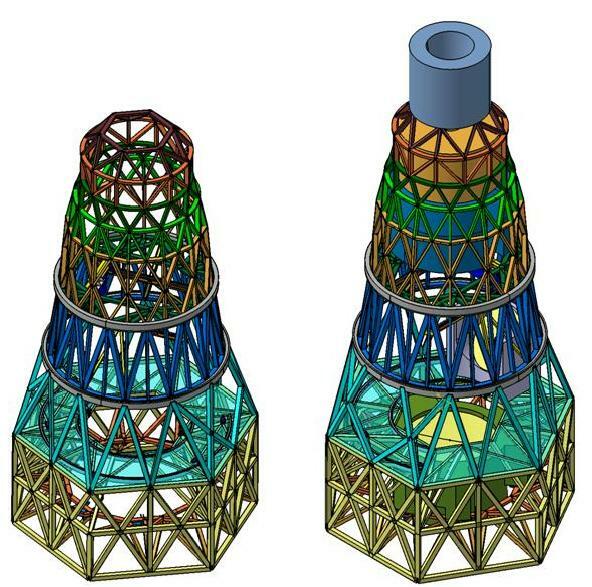 The main structure of the telescope was designed as to comply with critical performance needs, such as pointing and tracking specifications of 1 and 0.3-arcseconds, respectively. It is required that the main structure tracks sufficiently well under wind loads. Another important source of wavefront error is the movement of the secondary units with respect to the primary, and the support of the telescope was designed as to limit both the amplitude and frequency of the M2 unit deflections. The azimuth structure (see Figure 2) supports the scientific instruments. It rides on three azimuth rings, of 51.5-m, 34-m and 4.5m diameter. The two biggest rings support the main vertical reactions during all operational modes. The radial loads are supported by the intermediate ring, while the central ring supports part of the rotating floor. The azimuth structure is made of hollow members and weighs about 1300 t.
The azimuth structure contains also the two Nasmyth platforms, whose dimensions are approximately 12 m x 29 m and that weigh about 150 t. The Nasmyth platforms host the pre-focal stations and provide stable platforms for the post focal instrumentation. The altitude structure (see Figure 3) hosts the telescope optics. It is made of hollow beams and is estimated to weigh approximately 1500 t with the hosted units. The major challenges that have been addressed in the design are the need to keep the primary mirror segments within a reasonable range from their prescribed locations and the need to minimize the deflections of the secondary mirror. As shown in Figure 3, the large central obstruction of the optical design also provides ample room for the erection of a central tower (see also Figure 4). 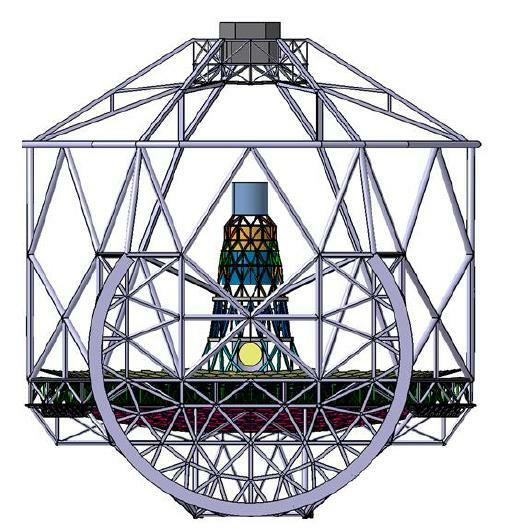 This tower supports M3, M4 and M5, together to the Atmospheric dispersion compensator (ADC) and the adaptive optics calibration unit (CU). The CU creates artificial sources at the side of the central tower and projects them on a small mirror positioned close to M4. An optomechanical relay system inserts the source light beam inside the telescope train when the CU is in operation.